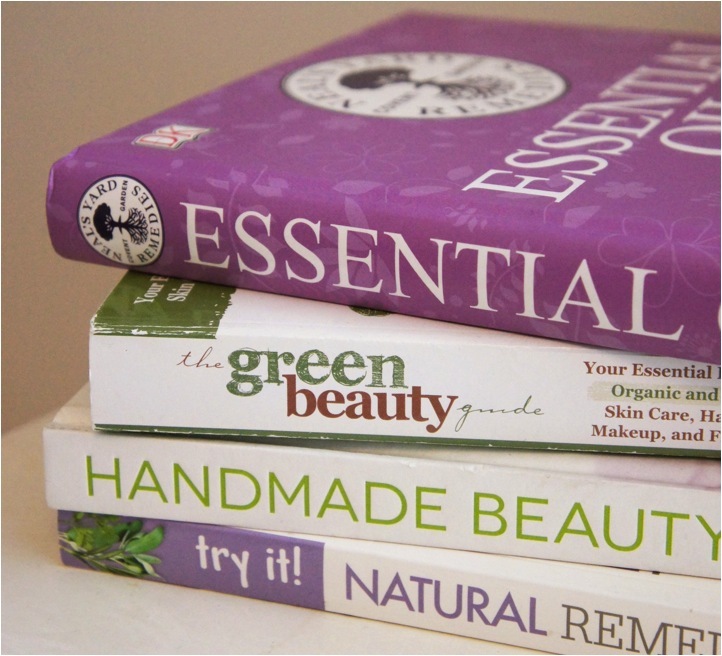 Over the past six months or so I've been gathering a small collection of books focused on a natural non-toxic lifestyle, featuring everything from homemade beauty products to natural remedies and the many uses of essential oils. Today I thought I would share a little bit more on four of the titles from my shelf. From what I've read so far this book is the ultimate guide to all things essential oils, with tons of information and suggestions for use of each oil. There's a section on base oils, as well as one sharing product recipes and another with natural healing remedies. The pages are laid out beautifully and the book is the perfect guide for anyone like myself who is fairly new to using essential oils - I'd highly recommend picking up a copy! I actually picked this book up in TK Maxx not long before Christmas and thought it looked like a very handy guide to add to my collection. This book not only covers recipes for non-toxic beauty but also covers household products and natural remedies for anything from headaches to arthritis. It even has a section which shares natural remedies for pet care! With over 1000 recipes and tips Natural Remedies is a great quick reference guide to have on your bookshelf. This recipe book is filled with ideas to create your own lip balms, face masks, bath bombs, shampoo, lotions and more. In addition there are guides on how to work with specific types of ingredients, equipment, product storage and sourcing the best ingredients. There's a handy glossary in the back sharing the benefits of each ingredient too. Again, this one is well designed with lots of lovely product photos throughout. This was actually the first book I invested in when I became seriously interested in non-toxic products. It includes product recipes and lots of useful information on skincare and ingredients. There's a brilliant handy guide to 100 most toxic ingredients in the back of this book and I have been known to carry a photocopied version of the list around in my bag to check up on product labels whilst I'm out shopping! Definitely one to pick up if you're interested in reading up on all things non-toxic beauty. Have you read any of these titles? Are there any other must-read 'natural living' books I'm missing? I'd love to hear your recommendations!